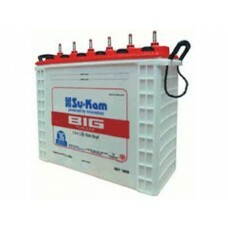 If you have ever wanted to get the best 200AH 12V Sukam tubular battery price in Nigeria? Then you need to consider the new generation of Sukam batteries that utilizes dual container construction. Each cell of the flooded Su kam battery is assembled in its own inner container made of high temperature retardant, durable polypropylene with the inner cover heat bonded to the container,(making acid leakage eliminated). The Sukam tubular battery is a maintainable Sukam battery for inverters that promises better battery perfermance and lifespan than other sealed maintenance free batteries in Nigeria. This is clearly demonstrated in the genuine 2 year warranty that Sukam offers on the 200AH 12V tubular battery. If you buy this Sukam tubular battery from Solaroid Energy, it comes ready to use with an electrolyte. That means you get it already flooded and charged, set for immediate use. This is done to ensure that the 12V 200AH Sukam Tubular Battery is treated with the right density of electrolyte and fully charged, to ensure it's in top condition to meet the high performance standard expected of it. The cells of the Sukam flooded battery is assembled into a high density tough polyethylene outer container with a removable lid. Even if the outer container were to break the battery would still be operable without the harmful affects of sulfuric acid spills. Very low maintenance & long life. Safe power AGM's are well suited to systems that get infrequent use as they typically have less than.. The 30kVA inverter is a rugged 3-phase pure sine wave inverter, suitable for businesses, hospi..